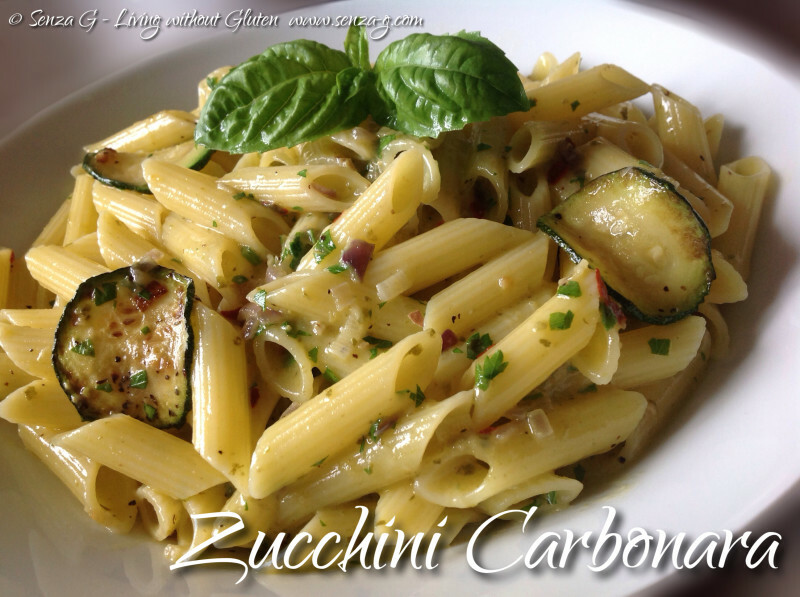 A vegetarian version of the classic Pasta Carbonara which is equally delicious. This time I thought of adding some pesto to the egg mix which really goes well with the zucchini. Came out really nice! Sauté the onions in a pan until translucent. Remove and set aside. Add a little more oil and cook the zucchini slices, turning often. Add the minced garlic towards the end of their cooking time as well as the sautéed onions back into the pan. Boil the Gluten Free Penne in a large pot. In the meantime, beat the eggs in a bowl, add freshly ground pepper, salt, chili if using, the grated Parmesan, the Pesto, chopped parsley and the milk. Combine well. As soon as the Penne are al dente, drain and put them back in the pot. Pour in the egg mix and the zucchini. Combine everything gently, yet quickly, as Gluten Free pasta breaks easily. Serve immediately with extra Parmesan Cheese.